A journalist and aspiring “speedcuber” attempts to break into the international phenomenon of speedsolving the Rubik’s Cube—think chess played at the speed of Ping-Pong—while exploring the Cube’s rise to iconic status around the globe and the lessons that can be learned through solving it. When Hungarian professor Ernő Rubik invented the Rubik’s Cube (or, rather, his Cube) in the 1970s out of wooden blocks, rubber bands, and paper clips, he didn’t even know if it could be solved, let alone that it would become the world’s most popular puzzle. Since its creation, the Cube has become many things to many people: one of the bestselling children’s toys of all time, a symbol of intellectual prowess, a frustrating puzzle with 43.2 quintillion possible permutations, and now a worldwide sporting phenomenon that is introducing the classic brainteaser to a new generation. In Cracking the Cube, Ian Scheffler reveals that cubing isn’t just fun and games. Along with participating in speedcubing competitions—from the World Championship to local tournaments—and interviewing key figures from the Cube’s history, he journeys to Budapest to seek a meeting with the legendary and notoriously reclusive Rubik, who is still tinkering away with puzzles in his seventies. Getting sucked into the competitive circuit himself, Scheffler becomes engrossed in solving Rubik’s Cube in under twenty seconds, the quasi-mystical barrier known as “sub-20,” which is to cubing what four minutes is to the mile: the difference between the best and everyone else. For Scheffler, the road to sub-20 is not just about memorizing algorithms or even solving the Rubik’s Cube. As he learns from the many gurus who cross his path, from pint-sized kids to engineering professors, it’s about learning to solve yourself. Ian Scheffler has written for The New Yorker, The Guardian, the Los Angeles Times, and the Los Angeles Review of Books. He holds a degree in English from Columbia University, where he co-edited the Columbia Review. Cracking the Cube is his first book. 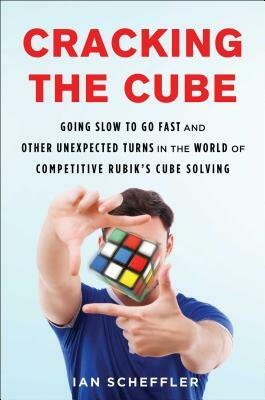 "Scheffler provides the first comprehensive book on the global phenomenon of speedcubing. Much has changed since the first world championship was organized in Budapest in 1982. But the emotions were all there already - good to see they haven't cooled in over three decades. The cubing community is growing ever larger, younger - and faster!" “After I completed my first Rubik's Cube it quickly went from a challenge to a hobby to an obsession. Scheffler provides a unique perspective into the competitive sub-culture of cubing, investigating the timelessness of the Cube as he chronicles his incredible journey around the globe to gain a better understanding of it. This is a book that anyone with a curious mind will enjoy!"